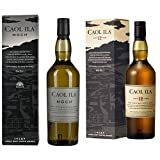 "70cl / 59.4% - A cask strength expression from the Caol Ila distillery, this 25 year old bottling was matured in refill American and European oak casks and it exudes oily, peaty notes with balancing sweetness. " "70cl / 43.0% - Part of Diageo's Distillers Edition range comes a 2001 vintage single malt Scotch whisky from Caol Ila, which has been matured in American oak and finished in Moscatel wine casks. A limited edition release." "70cl / 46.0% - A Hepburn's Choice bottling of 7-year-old Caol Ila single malt, drawn from a single refill hogshead cask. It was distilled on the Isle of Islay in 2011 and bottled by Langside in 2018 at 46% ABV with an outturn of 362 bottles." 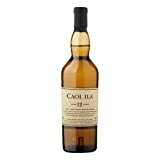 Caol Ila 2004 Distillers Edition Islay single malt Scotch whisky. Double matured in Moscatel oak casks, bottled 2016.